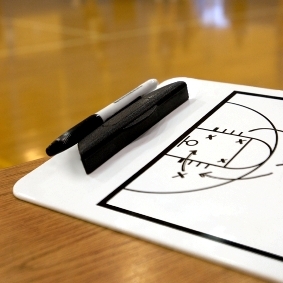 Many coaches struggle with ideas for [tag]kids basketball drills and skills[/tag]. Here are two suggestions from Amber and from Phil that work well. Give them a try. As an elementary school teacher I have combined the idea of cooperative learning and competition into the beginning of each [tag]basketball[/tag] [tag]practice[/tag]. I divide the group into two teams (of even talent). We do relays with skills such as [tag]dribbling[/tag], [tag]passing[/tag] and pivoting, and [tag]lay-ups[/tag]. The team that finishes last runs a lap then each team gets three minutes to work as a group to improve. The better players reach out to the strugglers and share tips that work for them. I have already done what I know to do to teach them, but their teammates can use words or actions that I haven’t thought of. I make sure to mix up the teams every practice so the same player is not slowing down the same group. I coach 7th grade boys, and every practice we have starts with a game of knockout. The catch is, as soon as you’re knocked out you start running the length of the court, over & over until the knockout game is done. No one wants to run, and they sure don’t want to do a lot of laps so they focus real intently on their [tag]free throws[/tag] & put-backs. The winner is the only one that doesn’t run any laps—that’s their reward.